Dr. Aubrey Milunsky gave a lecture on 3/21/19 to the Brandeis Osher Life-long Learning Institute. The topic: Avoidable Deaths and Harm due to Medical Negligence. 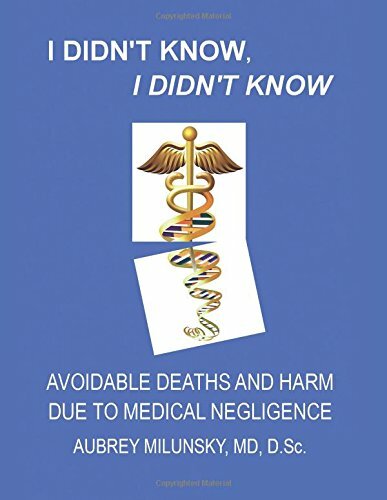 Dr. Aubrey Milunsky appeared on New/TV (channel 34) on 1/15/2019 discussing his new book I DIDN’T KNOW, I DIDN’T KNOW: Avoidable Deaths and Harm due to Medical Negligence (available on Amazon Books). at the Marfan Syndrome/Ehlers-Danlos Syndrome Foundation Connective Tissue Symposium in Manchester, NH, at the Best Western, on Sept 22. The 7th edition of GENETIC DISORDERS AND THE FETUS: DIAGNOSIS, PREVENTION, AND TREATMENT is now available from Wiley & Sons. The editors have added three new chapters to this edition (non-invasive prenatal screening, placental genetics, and the psychology of prenatal and perinatal grief) to complement the complete revision of existing content. Get your copy today! 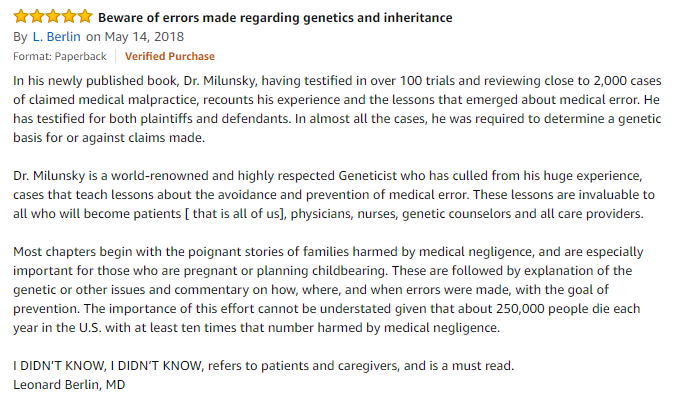 Dr. Aubrey Milunsky and Dr. Jeff Milunsky’s latest edition of their book, Genetic Disorders and the Fetus: Diagnosis, Prevention, and Treatment, was reviewed in the June edition of European Journal of Human Genetics. Dr. Aubrey Milunsky’s article, The “New Genetics” in Clinical Practice: A Brief Primer, was published in this month’s Journal of the American Board of Family Medicine. Milunsky A. The “New Genetics” in Clinical Practice: A Brief Primer. Journal of the American Board of Family Medicine. 2017;30( 3 377-379). Dr. Aubrey Milunsky was interviewed by WBUR 90.9 FM for it’s news piece, FDA Approves Companies Telling Consumers Genetic Risks Associated With Diseases. Dr. Jeff Milunsky delivered the OBGYN Grand Rounds lecture on Thursday, April 6 at St. Elizabeth’s Medical Center. In collaboration with the Nora Theater at the Central Square Theater, Dr. Aubrey Milunsky, will be leading a post show discussion of the play, PRECIOUS LITTLE, after the matinee performance on March 19, 2017. Come join the discussion. Dr. Aubrey Milunsky gave the grand rounds lecture, “New Genetics in Obstetrics Practice,” at St. Elizabeth’s Medical Center. Aubrey Milunsky, M.D., D.Sc. presents On Learning Genetics: Lessons from the Law. Grand Rounds in Obstetrics & Gynecology at St. Elizabeth’s Medical Center, October 13 in Boston, MA. Aubrey Milunsky, M.D., D.Sc. 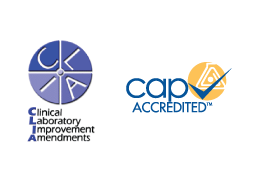 presents Diagnostic Gene Studies for Chronic Intestinal Pseudo-Obstruction at the AGMD Digestive Motility Patient & Family Conference July 29-30 in Bedford, MA. Aubrey Milunsky, M.D., D.Sc. and Jeff Milunsky, M.D. served as Co-Directors of the 32nd Annual Conference on Obstetrics, Gynecology, Perinatal Medicine, Neonatology, and the Law and the 16th Annual Multispecialty Conference on Medical Negligence & Risk Management, January 2 – 8, 2016, San Juan, PR. Hypoxia or Genetic Disorder: The Genetic Defense. Really?